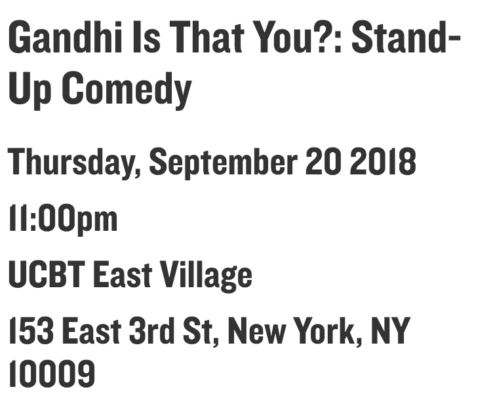 Gandhi Show – Tonight @ 11:00pm!!! – GANDHI, IS THAT YOU? Gandhi Show – Tonight @ 11:00pm!!! http://gandhiisthatyou.com/wp-content/uploads/2014/09/logo4.jpg 0 0 admin http://gandhiisthatyou.com/wp-content/uploads/2014/09/logo4.jpg admin2018-09-20 15:54:162018-09-20 15:56:59Gandhi Show - Tonight @ 11:00pm!!! UCB THEATRE EAST: Thursday, August 16th @ 11:00PM! Next Show – October 18th @ 11:00pm!